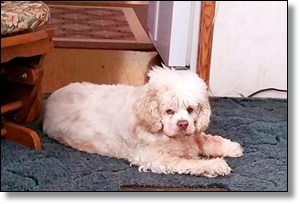 Two weeks ago, Kimberley Pearce of North Carolina had to have her 12-year-old cocker spaniel, Sadie, put to sleep. While getting some video of her new dog, a strange figure appears to walk across the screen. Is it a camera glitch, a hoax, or do you think it’s really Sadie’s spirit? It was only a few days after when I was showing the video to a friend that I saw her appear. I just knew it was her. That was my dog. I was in shock – I went outside and started to cry. But then I started to smile. I had been begging for her to give me a sign. You can see it’s a white and caramel color, and so was my little girl. The video had been taken around lunchtime and no cars go past my house to make a reflection, and no birds for a shadow or anything. We live quite far out in the country. There was nothing else it could have been. Before I kind of did and didn’t believe in ghosts. Now I really do believe. It might sound strange, but a couple of days after Sadie died I finally went and sat out on the porch and had a half hour conversation with her. In that conversation I just begged and begged for her or God to send me a sign so that I knew she was okay.